You know about the importance of curb appeal. It’s one of those terms that’s all over the home improvement shows! Curb appeal can make your home seem more inviting, warm, and friendly. It can even increase the value of your home and help boost the resale value. But curb appeal isn’t something that’s exclusive to daytime. Your home needs to look good at night, too. This is where exterior lighting can really help your home shine! 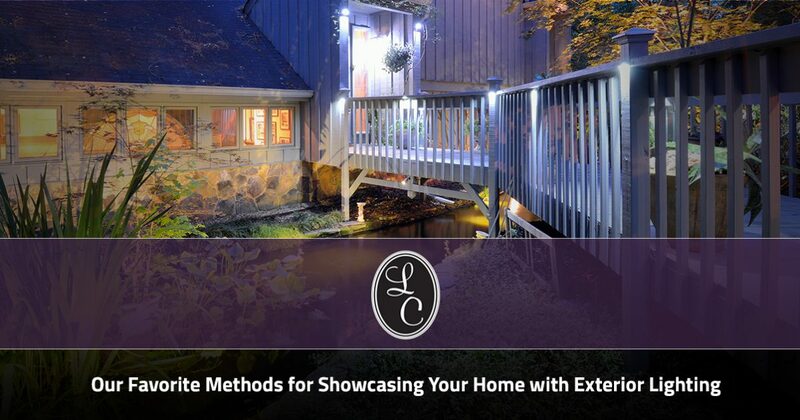 Here are some of our favorite tips for using exterior lighting in your home. When it comes to exterior lighting, you need to think up! Uplighting, that is. Uplighting is simply the term for aiming the lights up at the sky instead of most traditional lighting, which aims the light down. Uplighting will look more inviting and less like simple security lighting. It’s also the best option for highlighting the architecture of your home. When in doubt about landscape lighting, set your lights down low and aims them up high. Exterior lighting should focus on highlighting what’s special about your yard, even at night. If you have a special fountain or pond, light up the area. If you have a gorgeous tree, use uplighting to highlight it. Exterior lighting is all about showing off what’s special and important about your property, even at night. Look at the areas that stand out in your yard during the day and light them up for nighttime, too. Your lighting should have a focus. If you highlight ever special area of your exterior, it’s going to look more like a prison yard and less like a warmly-lit inviting space. Choose where you are going to focus your lighting. While highlighting one or two special areas of your yard is good, you should also consider highlighting the entry. This is good for security reasons, but it can also make it clear to guests where the entrance is. Outlining can be a really useful way to add more interest to your outdoor lighting. Consider additions such as lighting along the edges of a flower bed, or lining the pathway to your front door. Don’t get too hung up on tracing straight lines, though. It can start to look stark and cold. Following curved lines will add more visual interest to the landscape. While lighting the exterior of your home is great for nighttime curb appeal and resale value, it’s good for security, too. That’s why you should keep safety in mind when adding exterior lighting. Are there dark areas of your yard you can light up with a thoughtfully placed light shining on a tree? Would your guests appreciate pathway lighting to help them navigate their way to your front door? Marrying safety and beauty will help you achieve exterior lighting perfection. Looking for Great Exterior Lighting Options in Trussville? Lighting Concepts has all of the exterior lighting that you need for your Trussville home! From accent lights to pathway lighting to well lights and more, you’ll find a great selection on our website and all at competitive prices. Explore our website or visit our showroom to see many of our available products in person. Our knowledgeable team can help you create a lighting plan and find all of the supplies you need to pull it off. You can also give us a call or contact us through our website to learn more about our services or to ask a question about a product that you see on our website. Come discover what makes the premier lighting supply house in the area for yourself!